Female-fronted extreme metal bands, though a sparse group, encounter several difficulties in sound. Many such bands struggle to create enough variation in vocal styles to keep their records interesting. Naturally, women often cannot produce the required screams and growls that define the genre. 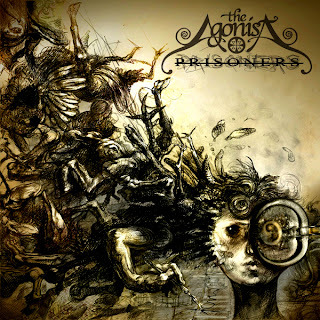 Montreal's The Agonist is an extreme metal group, that while suffers some of the same issues as thier contemporaries, manage an eclectic metal sound that can keep listeners interested. Vocalist Alyssa White-Gluz provides everything from deep-throated growls to piercing screams laced with her rangy clean vocals. Many of these vocals are obviously layered, but are impressive nonetheless. Influences including Pantera and In Flames are evident in the music, including groovy metallic riffs and thrashy drum patterns. The band incorporates some wicked guitar leads and progressive-styled acoustic strumming to create an unusual effect in the arena of extreme metal. White-Gluz has mentioned Radiohead as an influence for this record, but this influence is not pronounced enough to sound noticeable. Several good metal bands originate from Montreal, but few bands anywhere in the world come close to duplicating the niche that The Agonist fills. Prisoners is the bands third record and shows decent growth from Lullabies for the Dormant Mind, thier previous release. If you are into extreme metal, you might like The Agonist. It is an entertaining listen. I will chain Prisoners with 3.9/5 stars. I kind of like it. It sounds like a female Cradle of Filth.This is especially true with The Agonist.